This past Saturday we hit the Toronto Turkish Festival at Yonge-Dundas Square. It was a celebration of Turkish food and culture, but we were really there for dessert. I wanted some Turkish Coffee and Turkish Delight. Stacey was there for Baklava. We started off with some Manti - Turkish Ravioli. They were small pastries filled with ground beef, doused with garlic yogurt, with a dash of melted butter and paprika. The dumplings were nice one-bite sized morsels. The paprika went really well with the pasta, and the yogurt had a nice creamy tanginess. 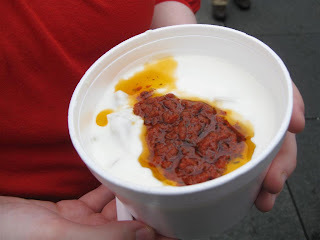 Stacey and I would have preferred to have the paprika and yogurt ratios flipped. There was way too much yogurt for our systems to handle. It was quite tasty. Appetizer out of the way, we lined up for some Doner Kebab, doner for short - slices of roast meat in a flatbread wrap with veggies. We had a chicken and a beef doner. 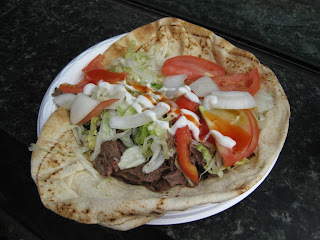 My beef doner had onions, lettuce and tomatoes, with garlic yogurt and hot sauce. 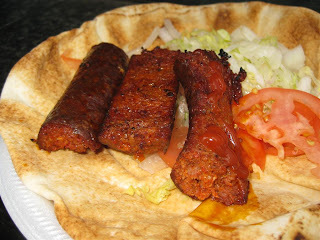 The doner is similar to the middle eastern shawarma or Greek gyros. The chicken doner was really good, with flavourful crunchy bits of chicken. Having room to split one more dish, we picked up a Sucuk - sausage. It was also in a wrap with the usual fixin's. What a hot sausage! The sausage skin was crispy from the grill, and the meat inside was soft and spicy. It stained our lips red and left a hot aftertaste, but it was really good. Alright, time for dessert. 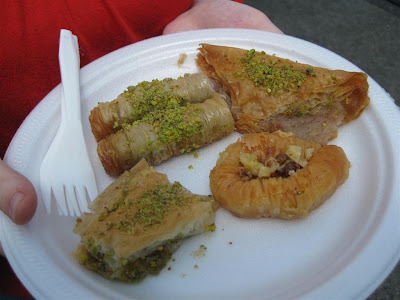 Baklava! We'll let your eyes goad your mouth to water on this one. Coffee was brought to the Europeans by the Turks in an accident of war in 1683. 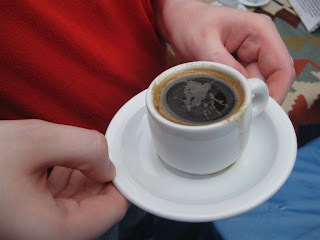 The term “coffee” was derived from the Turkish word “kahve.” Turkish Coffee is brewed in a small pot with water and sugar to avoid having to stir it when it's served. Neither milk nor cream is added. I really liked Turkish Coffee. It had a mellow mocha like taste, and the small amount of coffee grinds floating about added to its body. 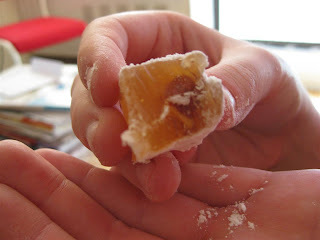 Turkish Delight is a treat made of sugar and cornstarch available with dried fruit or nuts. This was the highlight for me. They’re like uber-deluxe gummies. We bought a box of honey, almond and apricot Turkish Delights and it was dare we say… Delightful! Turkish military band from Tasting Toronto on Vimeo.